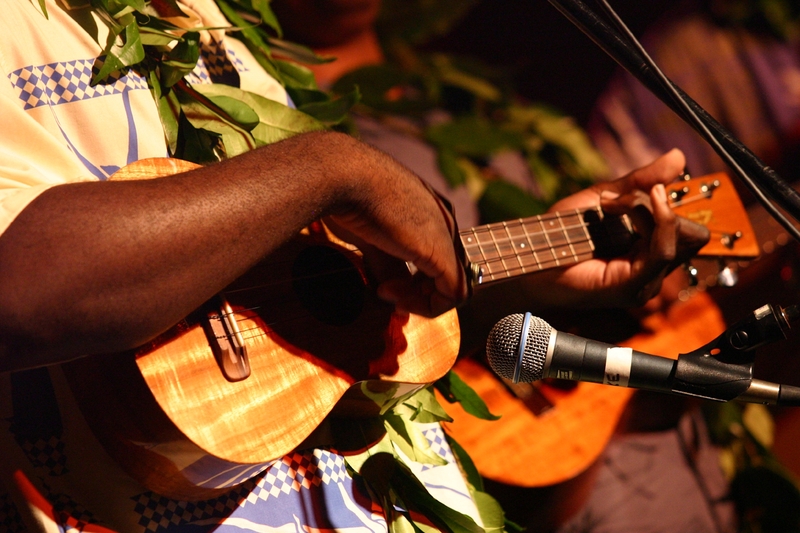 Hawaiʻi’s performing arts scene encompasses creative expression in music, dance, and theatre. As one of six major creative industries, musicians, dancers, actors, and others help spur economic development by performing for audiences worldwide and achieving international recognition for their songs, performances, and plays. Combined with applied design, film, interactive media, visual arts, and literary arts & publishing, Hawaiʻi’s creative industries represent $3.3 billion of the State’s GDP* as of 2015. Moreover, the creative sector’s collective impact includes 49,597 local jobs, which is a positive growth rate of nearly 8.9% since 2005. The performing arts is uniquely characterized by the way in which artists use their bodies or voices to convey meaning, emotion, and stories. The breadth of each subsector is described below with a comprehensive list located on the Creative Industries Division’s Resources page. Music – Hawaiʻi has an abundance of extraordinary musical talent, reflecting the rhythms of this tropical paradise. It is the birthplace of the steel guitar and home to the captivating sounds of kī hōʻalu (slack key) guitar tuning and the ukulele. With music that ranges from ancient chants and mele (songs) of Hawaiʻi to contemporary jazz, rock, and reggae, Hawaiʻi offers audiences a breadth of musical genres and talent. Dance – As a bridge between East and West, Hawaiʻi embraces numerous cultural dance forms such as Japanese bon dance, Tahitian dance, and Brazilian capoeira. It is also the birthplace of hula (Hawaiian dance). Many festivals celebrate the hula kahiko (ancient style) and the ʻauana (modern style) at annual gatherings such as the Merrie Monarch Hula Festival and the King Kamehameha Hula Competition. Theatre – Hawaiʻi offers classical theatre, contemporary dramas, and comedy, which can be enjoyed at local venues such as the Diamond Head Theatre and Honolulu Theatre for Youth. Many of Hawaiʻi’s actors who got their start in local theatre have gone on to star in Broadway shows, feature films, and television. Soul Sessions – Island Film Group developed a framework for Soul Sessions, a series of seventeen broadcast and web/mobile music videos featuring up-and-coming local musicians. The series brings local, national, and international attention to support the business development and promotion of Hawaiʻi’s music industry. Nā ʻOihana Mele Workshop Series – Hawaiʻi Academy of Recording Arts (HARA) produced three workshops: Marketing and Promotion Part I – Social Media, Marketing and Promotion Part 2 – Promotion, and Royalties as part of the Hawaiʻi International Film Festival’s 2013 Creative Lab program. Placing Your Music in TV and Film – Hawaiʻi Songwriting Festival organized a panel discussion to provide participants with opportunities and tools to get their music placed in television and film, thereby creating additional royalty and revenue streams for their original musical works. Sound x Vision – Co-presented by the Hawaiʻi Academy of Recording Artists (HARA), the 4th annual Sound x Vision featured a number of panel discussions with internationally renowned music composers who shared their compelling experiences and knowledge in the areas of film composition, marketing, and performance rights. Creative Lab Hawaiʻi Music Immersive – A five-day intensive program focuses on providing participants with the opportunity to co-write and produce music for specific film or TV projects with a team of professional mentors. Following the completion of the program, attendees will receive year-round mentoring support, and three of the most promising attendees will be selected by the mentors to participate in networking opportunities with music industry leaders in Los Angeles. In addition to composing songs, participants will learn the finer points of music licensing, publishing, intellectual property (IP) protection, and other aspects of the business from industry experts.